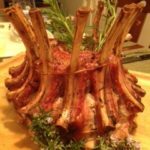 Berkshire heritage Pork Crown Roast, 7 LBS. Complete with MN Grown Wild Rice packet and recipe. Order direct from our farm. Naturally raised 100% certified Berkshire pork. The King of Roasts for this Holiday Season! Shipped in an insulated cooler direct to you. This is a very easy roast to prepare and serve by slicing between the bones. Takes about 3 hours to bake in a 350 degree oven. Recipe included.